Hello! 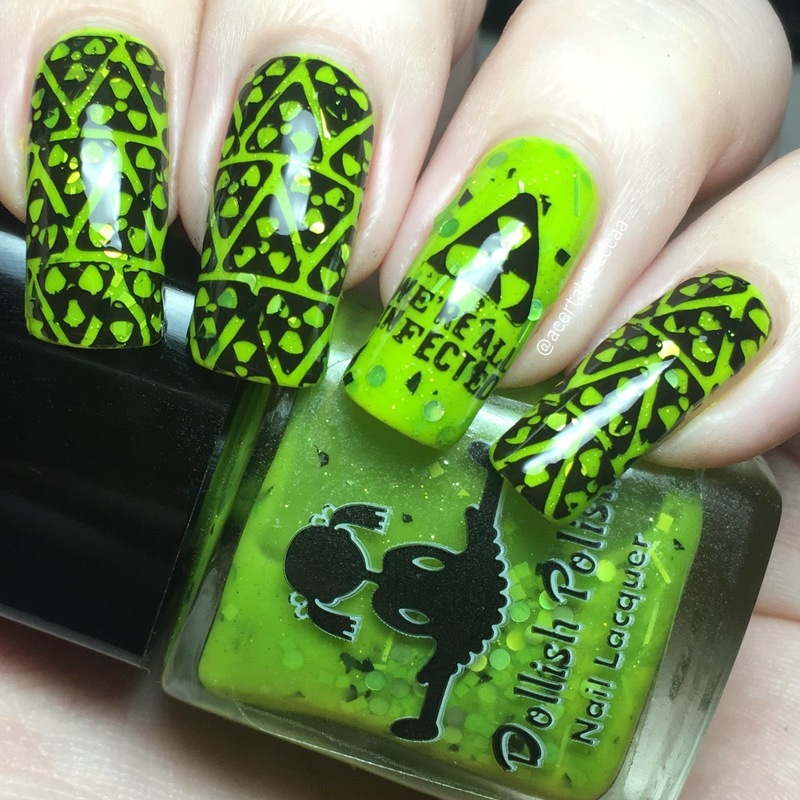 Today I have another Halloween mani to share with you, this time using UberChic Beauty plate Zombie Love 2 over a Halloween Dollish Polish that I purchased from their clearance bin (quite some time ago!). I thought the two would pair perfectly together and ended up going for a radioactive theme. Read on to find out more! 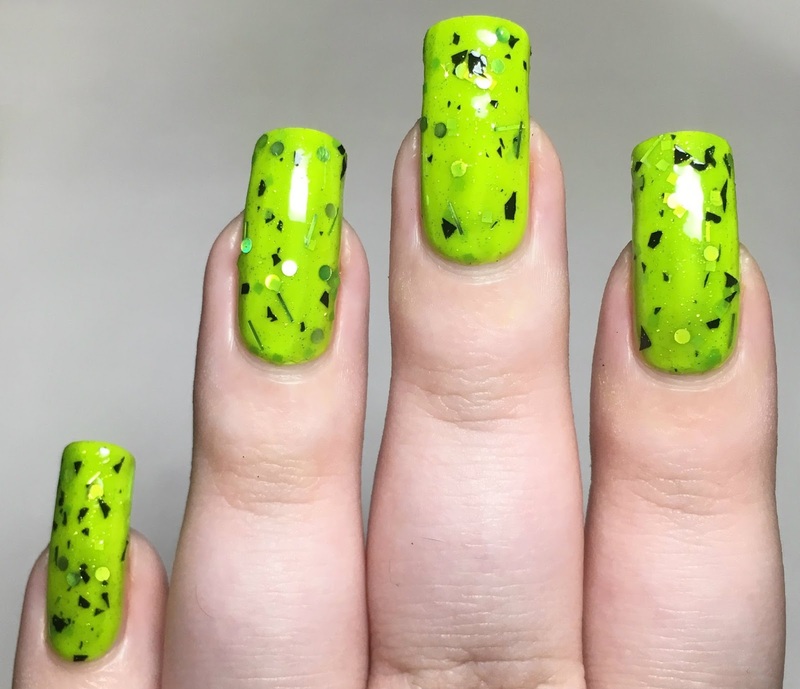 Dollish Polish 'What an Excellent Day for an Exorcism' is a neon lime green jelly with shimmer, and packed with black shards, and a variety of green, yellow, and holographic glitters inlcuding squares, circles, and bars. This is based on The Exorcist. The base is sheer on it's own, so I layered it over a lime green. Below is two coats with topcoat over Models Own 'Flip Flop'. As mentioned, I used UberChic Beauty Zombie Love 2 for my stamping. 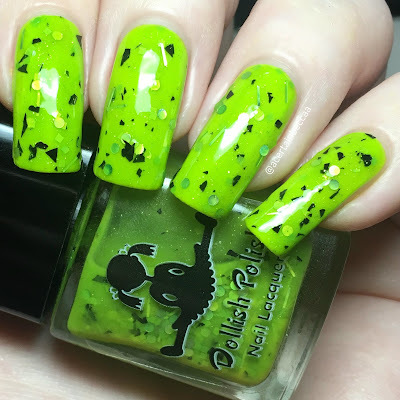 I thought the Dollish looked almost radioactive itself, so what better images to pair it with than the radioactive hazard symbols. Using Hit The Bottle 'As Black As Night', I stamped the repeated symbols on all nails except my ring. On my ring nail, I stamped the larger symbol, and added the 'We're All Infected' wording below. What do you think? I'm so happy with these! They are probably my favourite Halloween nails so far this year. The Dollish is one that people will either love or hate, and I definitely love it! 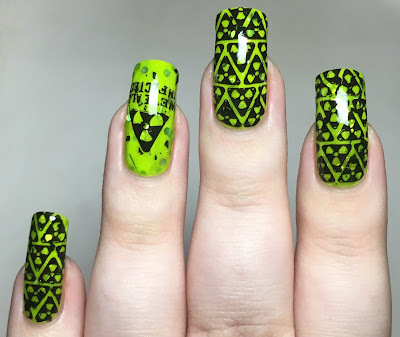 It's a perfect representation of The Exorcist, and a perfect neon Halloween polish. It also matches the Zombie Love plate nicely. 'What an Excellent Day for an Exorcism' was purchased from Dollish's clearance bin (on etsy here), so unfortunately is no longer available. You can find plenty of other polishes on the main site here. 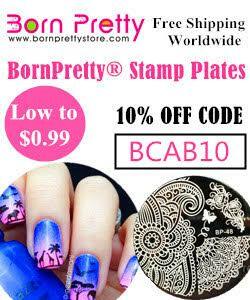 The UberChic Beauty Zombie Love 02 plate is available on Rainbow Connection here. I love love this polish, it's so gorgeous. I need to find myself a bottle asap. They both look really amazing!